Draft: 1998, Houston Astros, 7th rd. November 6, 2015 C John Buck elected free agency. March 26, 2015 C John Buck retired. 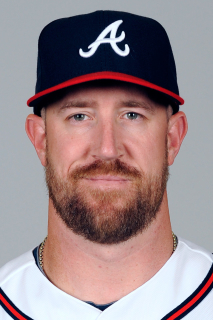 January 31, 2015 C John Buck assigned to Gwinnett Braves. January 25, 2015 Atlanta Braves signed free agent C John Buck to a minor league contract and invited him to spring training. October 10, 2014 C John Buck elected free agency. October 7, 2014 Los Angeles Angels designated C John Buck for assignment. October 2, 2014 Los Angeles Angels reassigned C John Buck to the minor leagues. September 2, 2014 Los Angeles Angels selected the contract of C John Buck from Salt Lake Bees. July 21, 2014 Los Angeles Angels signed free agent C John Buck to a minor league contract. July 21, 2014 C John Buck assigned to Salt Lake Bees. July 15, 2014 Seattle Mariners released C John Buck. July 7, 2014 Seattle Mariners designated C John Buck for assignment. January 16, 2014 Seattle Mariners signed free agent C John Buck. August 28, 2013 Pittsburgh Pirates activated C John Buck. August 20, 2013 John Buck roster status changed by New York Mets. August 17, 2013 New York Mets placed C John Buck on the paternity list. November 17, 2010 Florida Marlins signed free agent John Buck. November 7, 2010 C John Buck elected free agency. August 20, 2010 Toronto Blue Jays activated C John Buck from the 15-day disabled list. August 17, 2010 sent C John Buck on a rehab assignment to New Hampshire Fisher Cats. August 5, 2010 Toronto Blue Jays placed C John Buck on the 15-day disabled list. Lacerated right thumb. December 16, 2009 Toronto Blue Jays signed free agent C John Buck. December 13, 2009 C John Buck elected free agency. July 6, 2009 Kansas City Royals activated C John Buck from the 15-day disabled list. June 25, 2009 Kansas City Royals sent C John Buck on a rehab assignment to Omaha Royals.